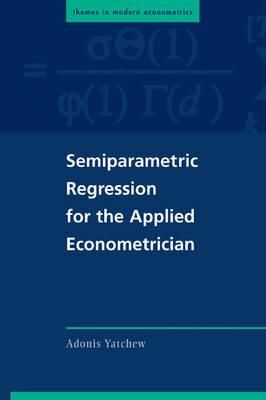 Description: This book provides an accessible collection of techniques for analyzing nonparametric and semiparametric regression models. Worked examples include estimation of Engel curves and equivalence scales, scale economies, semiparametric Cobb-Douglas, translog and CES cost functions, household gasoline consumption, hedonic housing prices, option prices and state price density estimation. The book should be of interest to a broad range of economists including those working in industrial organization, labor, development, urban, energy and financial economics. A variety of testing procedures are covered including simple goodness of fit tests and residual regression tests. These procedures can be used to test hypotheses such as parametric and semiparametric specifications, significance, monotonicity and additive separability. Other topics include endogeneity of parametric and nonparametric effects, as well as heteroskedasticity and autocorrelation in the residuals. Bootstrap procedures are provided.